Launched in March 2018, food delivery startup Plum announced its closure from 21 January 2019. This comes after news of the restructuring exercise that saw over 100 employees laid off at its headquarters in Hong Kong. Bike-sharing companies are not the only ones that can’t keep up with the competition. 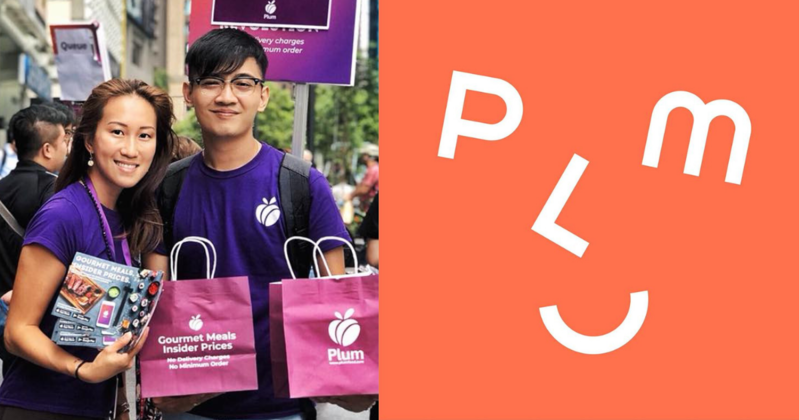 Hong Kong-based food delivery startup Plum announced on 19 January (Saturday) the closure of its Singapore operations in an email to customers, according to Channel NewsAsia (CNA). When we first got to know them in May last year, the team entered Singapore filled with confidence that their “human touch” approach to a disruptive business model would distinguish them from rivals here. “We believe that the personal touch of providing the best service possible to our customers is really what sets us apart, because we care. We ask customers what they like to eat and will source for those very dishes to put on the app,” said Monica Li, Director and co-founder of Plum. They first launched in November 2017 in Hong Kong and just five months later, in March 2018, in Singapore. South China Morning Post (SCMP) reported in November last year that Plum in Hong Kong had laid off all of its 110 full-time staff. Co-founder and General Manager of Plum, Desmond Clinton Cheung told SCMP that he had “terminated” his own contract as well and was finalising the number of employees who would stay in the newly restructured company. Under that new structure, employees who stay would be offered equity shares. This exercise came just after the first one which saw about 40 employees leaving the company “a few months ago to control costs and to see if it could optimise its cost structure”. Cheung reckoned that the company might have grown “a bit fast” and so it wanted to “right-size the organisation and set up the business model on a more sustainable path”. Was Plummeting Sales The Cause? 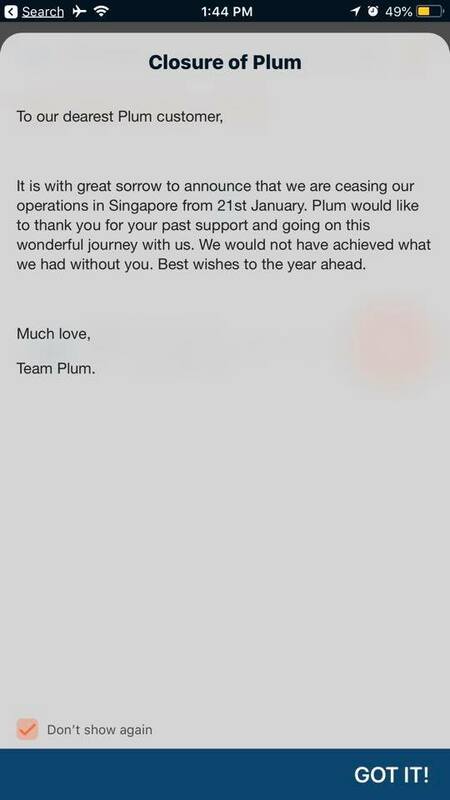 Despite reporting a 657% growth in just eight weeks and serving over 5,000 dishes since their launch in Singapore, Plum still had to call it quits here. As of 21 January 2019, their Facebook page has about 1,700 ‘likes’ but a quick browse shows low engagement and interactions in almost all of its posts. In Plum’s latest Facebook post, a user commented that he was about to sign up only to see news of its closure when he opened the app. CNA spoke to a Plum user who used the app once a week and had bought $30 worth of vouchers in November 2018, planning to use it before it expires by the end of February 2018. He felt “cheated” that he wasn’t notified earlier and that “[it’s] not ethical for companies to do this”. With bigger players in the market such as GrabFood, who regularly gives out promo codes, and Foodpanda and Deliveroo, it’s highly likely that Plum was unable to keep up with the money race and also lost out to the convenience factor. Add to that, Plum was only available in the CBD area as well as Fusionopolis. While their daily curated menu model was unique, they weren’t able to entice enough people to create a steady customer base. We’ve reached out to Plum for more details, watch this space. Govt And Businesses Are Pushing For A “Zero Waste” Future – But Are S’poreans On Board?